All the charts discussed so far have been an arithmetic Point and Figure chart, where the box size is the same throughout the chart. However it is possible to draw log scale charts where the value of the box increases as the price rises ensuring constant sensitivity throughout the chart. Log scaling is achieved by setting the box size to a percentage instead of a number of points. This ensures the percentage change from one box to another remains constant, but the box value at each price varies. A log scale Point and Figure graph is ideal for longer-term analysis. 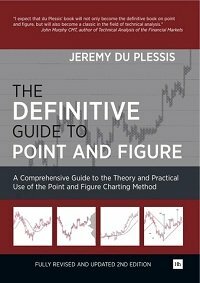 Many users of Point and Figure are unaware that it is possible to draw moving averages, Bollinger bands and technical indicators on a Point and Figure chart, because it is assumed that all these require the input of a time period. But, P&F charts advance as columns change from X to O, so moving averages and Bollinger bands can be calculated on the number of columns rather than on the number of time periods. The Point and Figure graph advances as columns change from X to O, so moving averages and Bollinger bands can be calculated on the number of columns rather than on the number of time periods. Figure 8 shows a 0.0075 (75 pip) x 3 Point and Figure of the Euro with a 10 column moving average and Bollinger bands 2 standard deviations away from it. This has opened up a whole new area of Point and Figure analysis, where traditional time series chart tools are being used in the same way on P&F charts. Point and Figure graphs are essential tools for any technical analyst. Anyone serious about using technical analysis for trading and investing should ensure that they are familiar with Point and Figure charts and their analysis. Jeremy du Plessis CMT FSTA is head of Technical Analysis at Updata Ltd based in London. He is a member of the Market Technicians Association (MTA) and American Association of Professional Technical Analysts (AAPTA) in the US, as well as a Fellow of the Society of Technical Analysts (STA) in the UK. He is a regular speaker on Point and Figure at international conferences and seminars. He is the author of The Definitive Guide to Point and Figure, first published by Harriman House in 2005 with a fully revised second edition published in 2012.